Polygamia's reporter Piotr Gnyp has been tweeting some tidbits of an interview with CD Projekt's Adam Kiciński, concerning Cyberpunk 2077 and their unannounced dark fantasy RPG (most likely The Witcher 3), which is apparently in a more advanced development phase than Cyberpunk. Thankfully a forum poster on the official The Witcher forums has translated the tweets. Dark City is coming back! Turn up da FIGGIN hype! Now now just let him be he might attack you. He is excited about the game that's all. Should this be "Night City is coming back"? not that I know anything about the Cyberpunk setting, but that's what I read on the police-borg insignia. I can't wait. That is all. Must remain calm. The only drawback is the game wont be out till late 2016-2017. Where have you seen that? Afaik, it's currently expected to be released sometime in mid to late 2015. Where have you seen that? Afaik, it's currently expected to be released sometime in late 2015. Watch the trailer as it says when its as good as done. Add a few delays as they always delay there releases and voila. Guesswork that's all satisfied now. It's still a long wait regardless. Not an easy thing to predict - but big ambitious RPGs tend to be delayed, and I'd say a 6-12 month delay is to be expected. Considering that we're talking about developers trying to actually evolve genres and not play it safe like 99% of the AAA companies - that's probably an optimistic expectation. And that's supposed to mean it's getting released in 2017? Ok. Unless it's a *lot* bigger than The Witcher 2, I think late 2015 is realistic. TW2 was announced in 2009 and released in May of 2011. I don't see Cyberpunk taking that much longer. But then I have no idea when exactly they began development either. 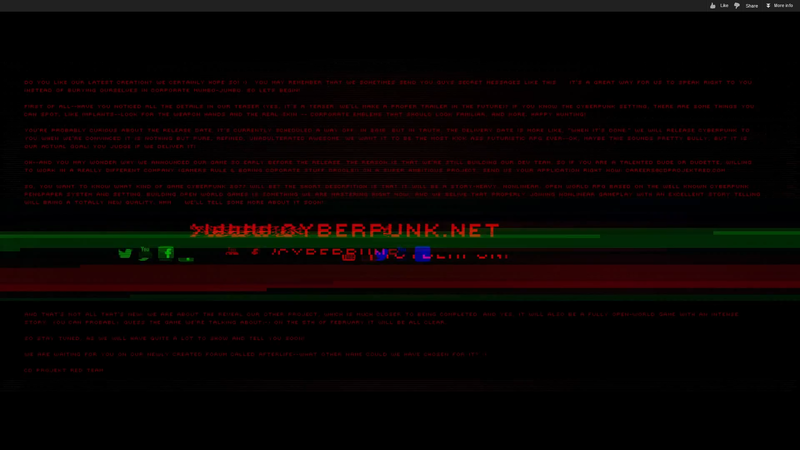 The secret message in the video says 2016 with a "it's mean when it's done". They are still hiring people to make the game as well. Interesting… The message states that their other project is also a "fully open-world game". So it would seem they're going open-world with The Witcher now as well. I bet couch is right on the year estimation. As CDPR is not Bethesda to release an unpolished game with 500+ bugs and then milk the mokey with expensive DLC in a buggy game without fixing those bugs. CDPR respects all audience which includes nitpicks like me, plus their DLC is free. Since there is no reason to believe they'll release a half-done project, 2016-2017 is my guess too. Or that they don't have the usual definition of "fully open-world game" as most people do. Did they use it for the Witcher 2? The Cyberpunk 2077 game is made with the RedEngine too, maybe it's simpler to make it support open-world and use it for the next Witcher game than try to maintain two different code base for world loading in it. No, Witcher 2 wasn't marketed as open world. I just hope CDProjekt learns how to optimize their games to make better use of multicore CPUs, hopefully the next game will not look and run like total crap for those of us who lack a super high end graphics card. Why worry? By the time CyP2077 is released, you'll have a cheap card that'll do things at least twice better/faster/richer than nextgen consoles.